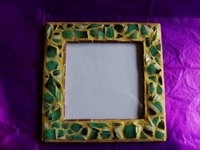 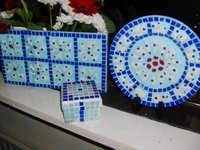 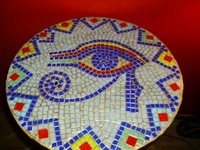 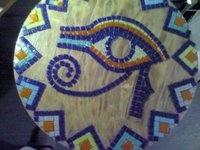 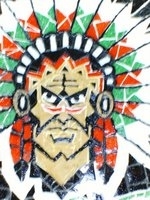 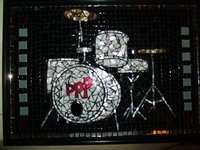 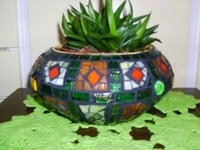 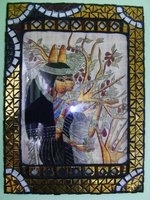 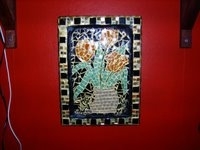 For more info about mosaic art join my forum. 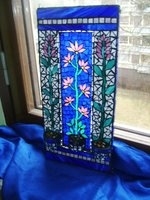 Blue stained glass window I used resin instead of grout, compliments to the Happy Auer Show on YouTube. 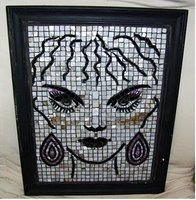 I also uploaded my own mosaic videos on YouTube search for "MosaicMaiden"
Looks like the joker from Mars. 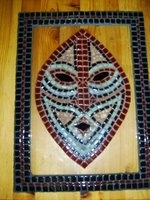 Mask make with a variety of stones and matching frame. 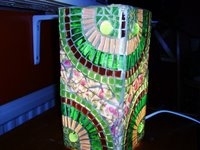 This ceiling lamp is a special order for customer who loves earthy tones the grout is actually chocolate brown. 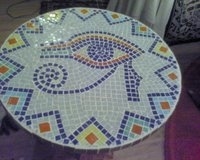 My Brother in laws company Logo "name ISP"
Originally the grout for this table was white and it almost blinded me it has a mixture of glass and ceramic tiles (Sold). 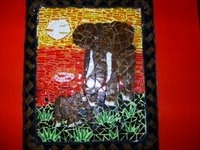 The Elephants (Mother and baby) (Sold). 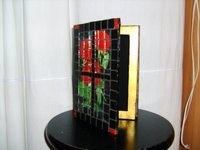 This window made with ceramic tiles, before and after is one of my favorites I wish you could see it in real life it is roughly A4 square in size (Sold). 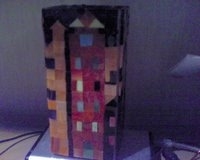 "Citadel", all sides have a different house on it. 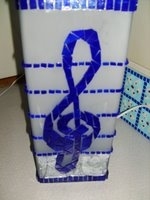 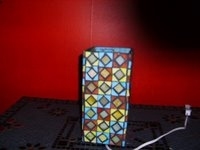 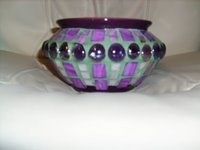 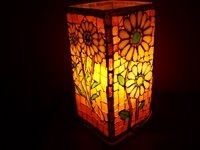 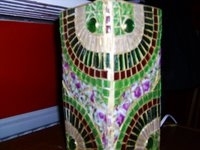 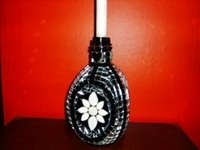 this was made with tiffany tiles perfect for lamps. 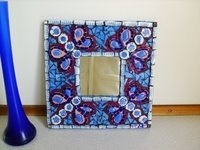 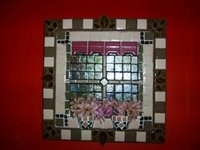 "Piffany" ;) with tiffany stained glass tiles. 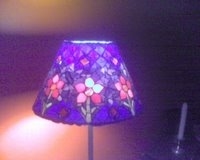 My first lamp many flaws "you live and you learn" but I love the way she lights up. 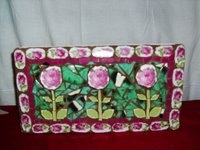 Broken Plates on a plate , oblong vase with matching box for bits and pieces. 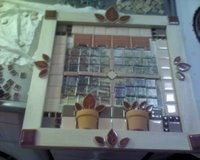 My friend wants to buy this but it suites my kitchen so well. 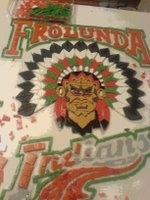 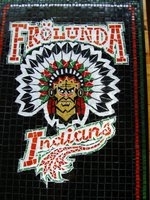 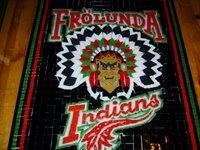 A work in progress my husbands favourite hockey team logo "Frölunda Indians" almost there! 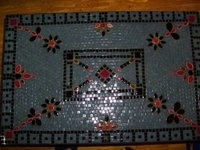 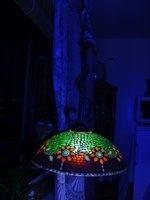 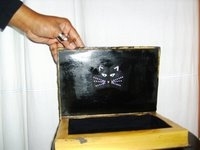 It's quite large and measures 70cm long 50cm wide. 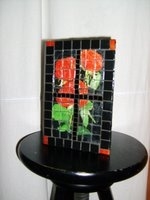 Mixed media of glass and polymer clay. 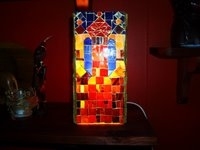 Candle holder with mirrored, glass and ceramic tiles ungrouted as yet. 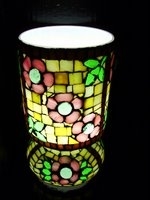 My Latest lamp experiment made with fine porcelain rose chintz and high quality glass tiles. 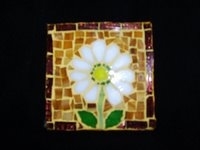 All the mosaic images on this page are originals created by me Patricia Page Leandersson please do not copy without my permission. 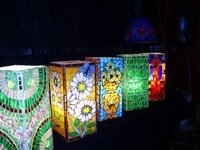 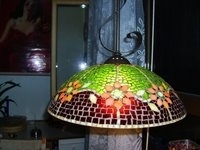 Tables, Lamps, portraits, vases, furniture, you name I can mosaic it, Classic or modern. 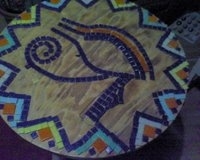 "May your hands always be busy"